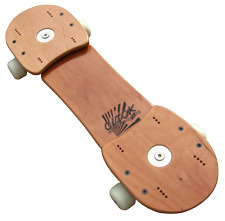 The Click Streetboard: EVERY STREETBOARDER OLD OR NEW SHOULD GET ONE OF THESE!!! This board is a new concept from Highland Streetboards aimed specifically at those on a budget who want a basic Streetboard to start things off. This board is small and light enough to be easily carried around by anyone making it idea for all sizes of rider, even experienced riders who want a spare board to carry around looking for any cruising opportunities. Of course this board is not just for cruising but can be used for tricks as well thanks to the predrilled binding holes allowing for standard streetboard bindings to be attached. 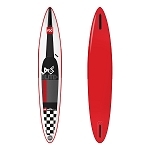 With a 48 cm stance this board is the second smallest available and should be fine for any rider but the very tallest as a cruising or beginning board. This board comes in a choice of a stylish natural wood finish or a striking white finish to suit your taste. Low cost but high quality made from real Maple wood it looks and feels expensive! This board comes boxed and assembled ready to ride complete with wheels fitted and griptape cut and ready to stick on!